ICHTIS portal was created in September 2007 by priests and young people, who like you, are following the way of Christ. We hope this brings us closer to you and we want our work not to be anonymous anymore. Since the portal was created it has been very popular in Poland and abroad. It is specially created for young people and students of the roman – catholic Church in Szczecińsko – Kamieńska Archdiocese (www.szczecin.kuria.pl ), of which Szczecin is the capital, situated by the Baltic Sea (www.szczecin.pl). The name of the portal is from greek word “Ichtys” – sign of first Christians and also a symbol for Christ. ICHTHYS is an acrostics a word created from the first letters of other words. “Ichthys” (also written as “ichtys” - ΙΧΘΥΣ )in ancient greek means “fish” - refers to the essence of christianity. Fish – ΙΧΘΥΣ - is also logo of the portal and it comes from following words: ΙΗΣΟΥΣ (Iēsoûs) Jesus , ΧΡΙΣΤΟΣ (Christós) Christ, ΘΕΟΥ (Theoû) God’s , ΥΙΟΣ (Hyiós) Son , ΣΩΤΗΡ (Sōtér) Saviour. Information on upcoming meetings and events for young people can be found in the calendar where you can also add events → Kalendarz wydarzen (Calendar). 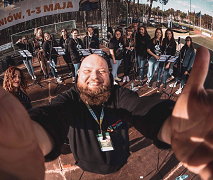 Young people often encounter loneliness, so we bring you information about different communities, association and groups because we believe community is a source of strength → Razem mozna wiecej (Together we can more). For people who like to read different homilies and conferences we offer them pulpit for young → Ambona dla mlodych (Pulpit for young). We present articles on various topics, as well as the testimonies of Christian life in Chapter → Świadectwa oraz Artykuły (Testimonies and articles). An important element of the Christian life is also Holy Mass on Sunday. This helps us to comment on the word of God for the coming service, which is a good preparation for Holy Mass → Komentarze na niedziele (Sunday’s reflection). We want the cities and states, which we have already visited, imagine the beauty of the world, that God has created → Podróże (Travel). The youth of Western Pomerania meet annually at the Archdiocese Youth Day. It is the biggest retreat for young people in our region. Where they get a chance to meet with people from for example: Germany and Belarus. You can find more information of Youth Day here. → Dni Młodych (Youth Day). For many years we have been also participating in the World Youth Day →Światowy Dzień Młodzieży (World Youth Day) - Sydney 2008. In addition to the great mass meetings, the meeting in small groups is very important to us. This brings to you a series of retreats → Rekolekcje młodzieżowe ( Retreats). Young people often look for good websites; we offer such sites, arranged by topic → Dobre Strony (Good websites). In addition to this website is → Multimedia, where you can find homilies and conferences In MP3 format → retreats and MP3 conferences, as well as Power Point presentations → Presentations and a rapidly growing Christian radio and TV stations → Christian TV and radio on-line. We would like to encourage you to visit the next section→Video, where you can watch very interesting and valuable video with Christian messages. Photography can say so much that’s why we have a great photo gallery, reflecting the latest events. We also want to offer you free of charge Internet booking, to help you organise events. All that has been created specially for you. We would like to encourage young people to send us photos, comments, testimonies and different footage (like audio, video, mp3, pps, ppt etc) or links to different multimedia files to share with others. Popularity and effectiveness of this website depends on its readers. So forward this website include its logo or banner→ O nas / Kontakt(About Us/Contacts) →promotion materials, check it out and join us!